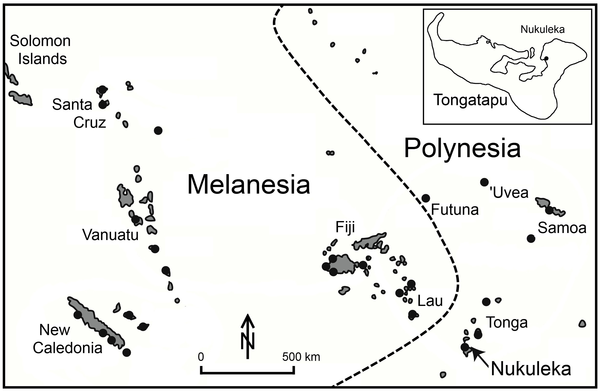 Lapita site distribution in Remote Oceania. Black dots represent Lapita sites or site concentrations. Nukuleka occurs on the southern island of Tongatapu, Kingdom of Tonga. A Simon Fraser University archaeologist and his colleagues at the University of Queensland in Australia have significantly narrowed down the time frame during which the last major chapter in human colonization, the Polynesian triangle, occurred. SFU professor David Burley, Marshall Weisler and Jian-Xin Zhao argue the first boats arrived between 880 and 896 BC. The 16-year window is far smaller than the previous radiocarbon-dated estimate of 178 years between 2,789 and 2,947 years ago. Burley, the lead author, and his colleagues have recently had their claims published in anarticle in the open access journal PLoSONE. Polynesia, a group of 1,000 islands forming a geographic triangle connecting Hawaii, New Zealand and Easter Island in the South Pacific Ocean, is one of the last landscapes discovered and settled by humans. Burley’s team applied uranium/thorium dating to a series of coral artifacts recovered from a site in Tonga known to be the first settlement location for Polynesia. This dating technique is not new, having been used previously to date coral reefs and stalagmites in caves and other materials. But this study’s authors had to develop new processes and verification protocols to achieve their more precise dating of the Tongan artifacts. The researchers dated coral files, common day artifacts used to file-down wood or shell materials for manufacturing other artifacts. Thirteen of these were successfully dated, all nicely falling into a temporal sequence from top to bottom of their archaeological siting. Burley is most excited about a coral file found in the very bottom of the site. Not only does it have the oldest date, but also it was found in beach sand, over which the archaeological site formed. “It is the beach on which first landfall took place, and we now know exactly when that happened,” says Burley. Prior to this study, archaeologists had used uranium/thorium dating in Polynesia to date coral sprigs in temples sites in Hawaii and Tahiti. None was older than 500 years. Burley and his colleagues are now looking at applying their techniques to other sites in Tonga and elsewhere across Oceania (tropical Pacific Ocean islands) where coral files are present. They hope to gain a highly detailed understanding of how long and at what pace South Pacific settlement took place. The full article is available as a Nov 7 PLoSONE release.